Are Nike, Under Armour and Adidas Overpaying for University Athletic Department Sponsorships? Those four words are enough to bring a smile to millions of faces across America. As the 2015-16 season kicks off, there are some exciting story lines brewing. From the quarterback competition at Ohio State to whether the College Football Playoff will face the sophomore slump, fans certainly have enough interesting fodder. One conversation that can't be ignored, though, is the economics of college football. 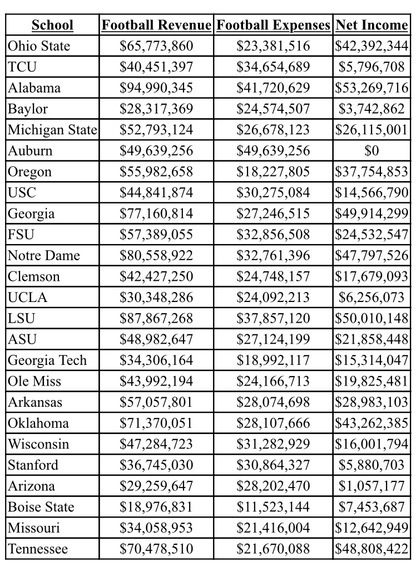 In an age when the NCAA is facing multiple lawsuits challenging its standard of amateurism, conversations about college football must consider the money that the sport generates. When it comes to the AP pre-season top-25, this year's teams win both on the field and in the bank account. 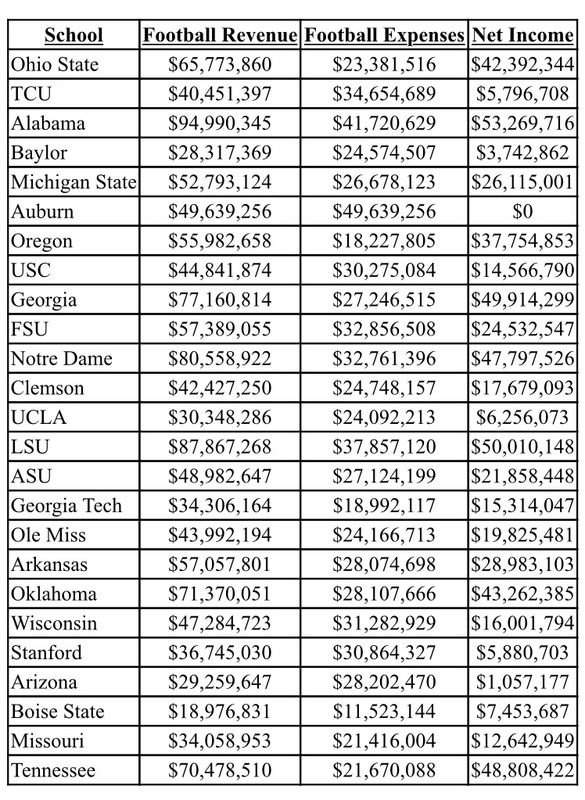 The chart below highlights the revenues, expenses and net incomes of teams ranked in this year's AP pre-season top-25 that were reported by universities to the Department of Education. The data is from the 2014 fiscal year. There are several key things to note about the data above. The first is that it is the only data publicly available on public and private universities' athletics departments' finances. However, the way in which athletics departments report and calculate the numbers submitted to the Department of Education is largely unregulated. For instance, some universities may report things, like capital expenditures, as an expenditure, while others may not. As a result, the numbers reported above cannot be taken as conclusive representations of the athletics departments' financial statuses. They do, however, provide good insight into the amount of money that individual teams generate and spend. In the last 18 months, one of the greatest economic story lines surrounding college athletics was the signing of new apparel deals by athletics departments. This summer, the University of Miami -- the first athletics department ever with an apparel deal -- left Nike and signed with adidas. Miami's deal came after Notre Dame's January 2014 departure from adidas to Under Armour, after a 17-year partnership with adidas. Adidas, which previously boasted the most-expensive athletics apparel contract with the University of Michigan, lost that title when Nike signed the Wolverines this July. Athletics departments generate significant income from deals with apparel providers. For instance, Alabama, the highest revenue generating team in the AP pre-season top-25, enjoyed a contract with Nike last season worth $3,570,000. Smaller programs, like Boise State, even generate 7-figure deals. In 2014-15, Boise State's apparel contract with Nike was valued at $1,040,000. With apparel companies shelling out big money to ink deals with athletics departments, the question becomes, are the deals worth it? Some experts believe that apparel companies are overpaying the universities they partner with. Recently, Adobe Digital Index analyst, Joe Martin, completed research analyzing whether apparel companies are overpaying for athletics department sponsorships. In generating his analysis, Martin focused on the social media reach of athletics departments versus what apparel providers pay them for the sponsorships. From this analysis, Martin concluded that apparel companies may be overspending on athletics department sponsorships. For instance, Martin found that Nike's contract with the University of Michigan equates to spending $6.50 for each of its athletics department's Twitter and Facebook followers. Conversely, the money the brand pays for its partnership with LeBron James equates to $0.67 for each of the NBA player's 45 million Facebook and Twitter followers. "Looking at the top college paid team for the three major apparel companies and the top paid player endorsed by each of those brands and putting that on a social plane, on average, these apparel companies pay 24-times more for access to college teams than they do for professional athletes," Martin remarked. Although from a social media perspective, apparel companies may be overpaying for their athletic department deals, marketing experts believe that these partnerships are valuable for both sides. "Large-scale college sports apparel deals are well worth the spend. FBS schools provide mass exposure, loyal fan bases, and tap into the coveted millennial demographic. You don't have to look beyond football to see why companies are buying in. Viewership for the first-ever College Football Playoff championship generated the highest ratings in the history of both ESPN and cable television," noted Dr. Windy Dees, an associate professor at the University of Miami, who teaches sports marketing. That being said, it's likely that the arms race between athletic apparel companies to capture partnerships with successful athletics departments will continue. While it's unknown which schools will jump brand loyalties or re-up with their current apparel provider, one thing is certain: Forthcoming apparel deals will continue driving athletics departments' revenues to new heights.